I am taking you into the inner sanctum today ladies and Malcolm. If there are any other guys out there, mail me and I'll include you to. I can't see how men would find this kind of stuff remotely interesting, but one never does quite know who is watching. Now this is the real Beach House central. Forget kitchen island benches, re purposed vintage cane lounges on the deck or white tablescapes people. This little 2x2 metre squared room is where it all really happens. It's a tiny little ensuite to the master bedroom. As far as I can see, it used to be a cupboard and the last owners of the Beach House made it over into a tiny little bathroom. Let just say I would not have bought this house without an ensuite and now seven years on, I'm so happy to be living here, so I'm glad they had the foresight to do the cupboard conversion. With large white tiles on the walls and a neutral floor tile, it's got Australian Beach House bathroom written all over it. The little indented tile nook, of which there are 2 in this room, creates a very clean and efficient way to store my scents and body products. 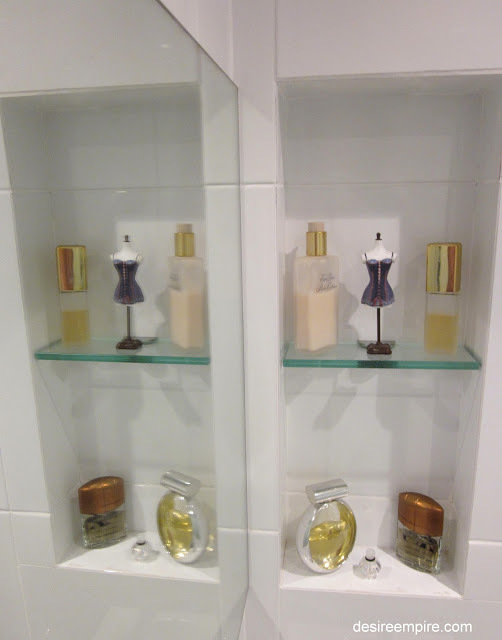 Mr Beach House's Paco Rabanne also gets a look in here. I gave that to him one Christmas, after noticing it on a very attractive friend of his. You know the kind, the guy that dresses to kill, smells absolutely gorgeous and can charm any woman he wants. He makes you feel like you are the only woman on the planet when you are talking to him. But I know better....this guy was the one shaking his car keys up the back of our wedding ceremony, on Whale Beach, saying to Mr Beach House that it was his last chance to get away. Isn't it lucky I'm so understanding and it was such a relaxed wedding...... we just laughed about him. The banks are always chasing this guy and it's hard to keep up with him, as he is forever changing his mobile phone number. We love his company and he sure smells good, but Mr Beach House and I know where to draw the line. He's great to hang out with, but we do not get involved in any way with him, other than socially. Anyway he's fabulous for sourcing male body products. Funny thing is, Mr Beach House never squirts the Paco on willingly, so I end up chasing him around the bedroom, trying to get some onto the nape of his neck before we go out. I mean I do have my standards and being on the arm of a man who smells good is one of them. When we purchased the house, there was no towel rack or toilet roll holder installed in here. As I didn't trust Mr Beach House not to crack the tiles whilst using the drill to install said accessories, I improvised. 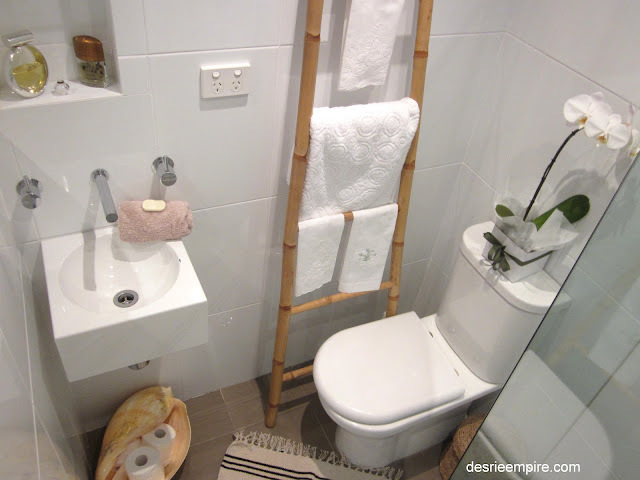 I used the bamboo ladder to hold the towels and hand linen and a huge shell to hold the rolls. 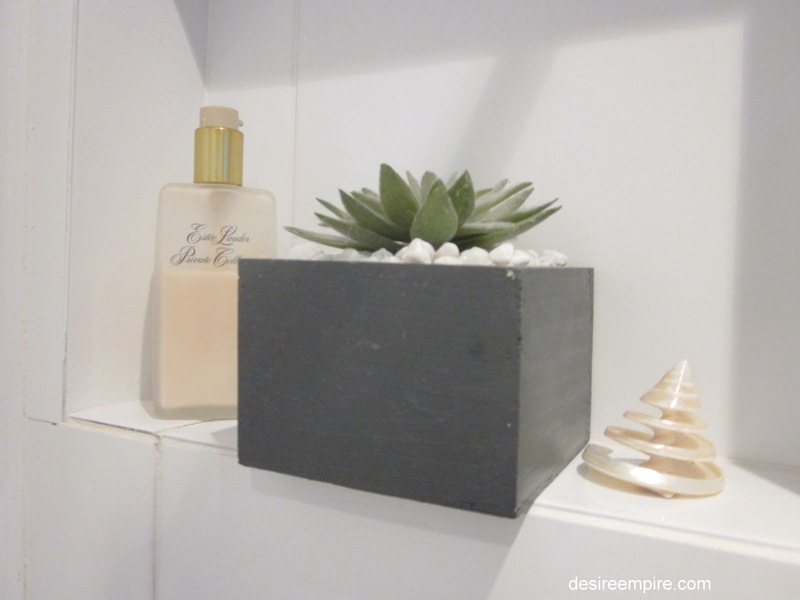 These are great storage ideas for any bathroom and look like they were meant to be. 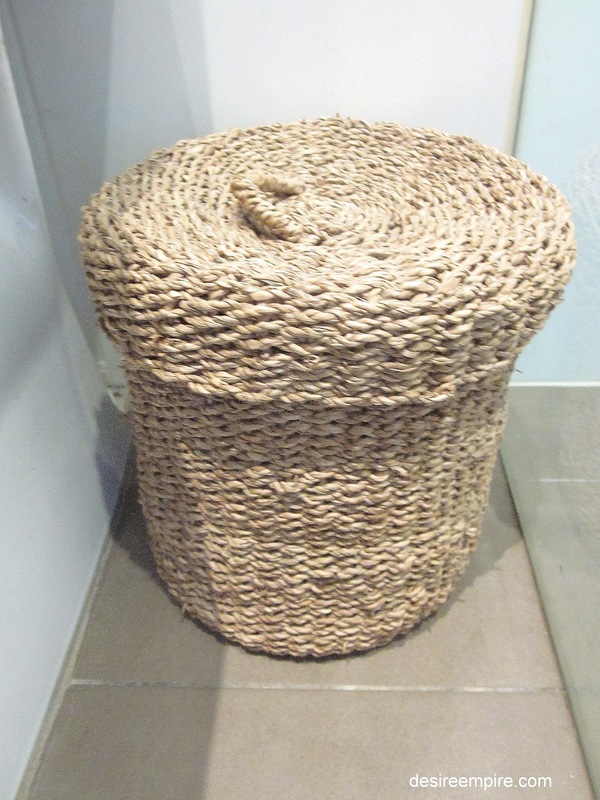 In addition to the shells, the coir bin also adds to the coastal feel of this room. I actually use this to store girly stuff as well. 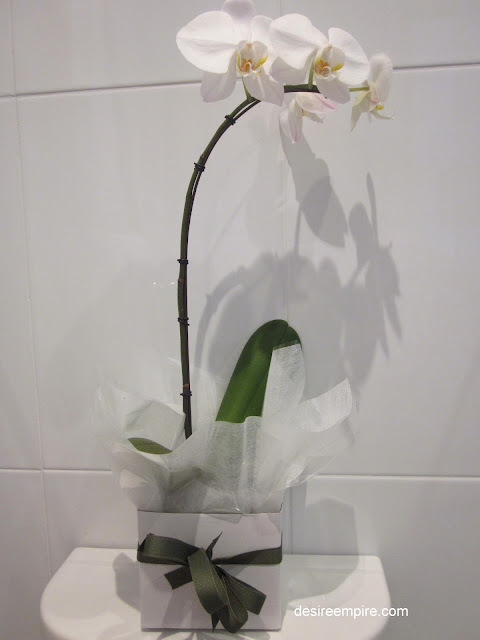 And here's the lovely Chinese Orchid that Mel gave me at our Northern Beaches Bloggers lunch you can read about here. I absolutely adore this beautiful flower. And it wouldn't be the Beach house without a touch of Ikea. The mat is a newish addition, tying all the neutral tones together. On a completely different note.....remember how I went to that dinner in the city for an old friend's 50th. Well it was a fabulous night. We went to Ripples at Pyrmont, fabulous food and great company. It was funny seeing all the guys again, some of whom I hadn't seen for 25 years. We ended up at the casino. I had a little flutter and a big win (for me anyway) on the roulette table. I'm lucky like that. I won my stake back and had put that back in my purse. I was gambling with my winnings and was down to my last chip, we were just leaving and I did my old faithful and put it on Number 3. I don't know what it is, but it came up. I haven't been to a casino for years, but this little tradition has worked for me in the past. So I won quite a bit. I stayed at mum's, as she looked after the kiddos, because Mr Beach House was away sailing for the weekend. Mum's neighbours had a garage sale the next morning. Funnily enough mum's neighbour is an old school mate...she was a model and still works as a fitting model for a fashion house. Consequently, she has racks and racks of gorgeous clothes for sale and I had some lucky $$$$ to spend didn't I. The synergy was too good to be true. Lets just say my wardrobe is set for next season. I'm feeling very lucky today. Lucky that Mr Beach House didn't accept his friend's offer of a free ride out of our wedding ceremony. Lucky to have lovely friends that care about me enough to catch up after many years and be so charming in the process. And lucky to have a lovely neighbour who was selling lots of designer clothes, some still with the labels attached, at great prices. Love the giant white tiles!!! Beautiful! 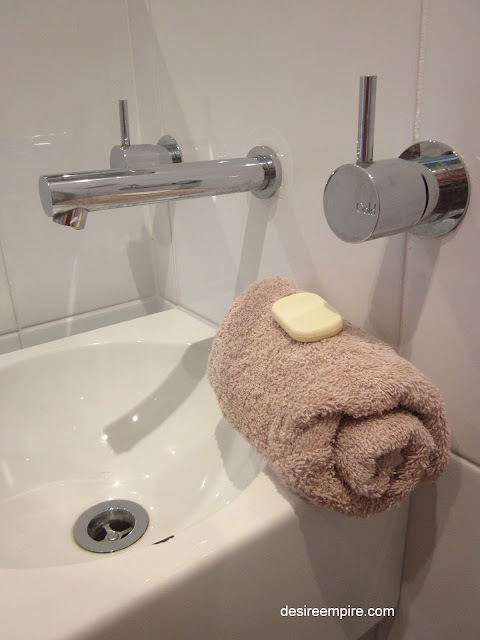 Looks like you have made the most of a small space, looks very fresh and clean! I love the giant shell, that is beautiful! Oh how I would love a gorgeous ensuite like that! Very clever of the previous owners and you have made it even more functional. Just popped over from Sumo's Sweet Stuff link party, what a beautiful bathroom (and home) you have! Following along via GFC. Looks fantastic! I love the ladder as a towel holder that the shell that holds the tp. Great job! love all the white and the vintage towels on the ladder! Love that giant shell full of loo paper. Looks fab. PS Adsense rejected me! Love the first photo! Darling bathroom. Surprisingly information that you have shared. 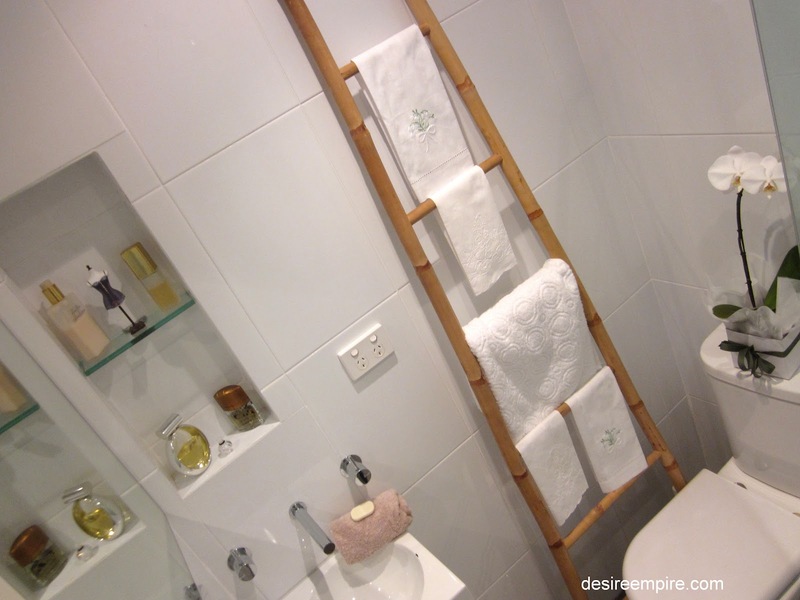 I love that bamboo ladder, it's perfect! What a great bathroom space. Following you back with linky tools too! Beautiful! 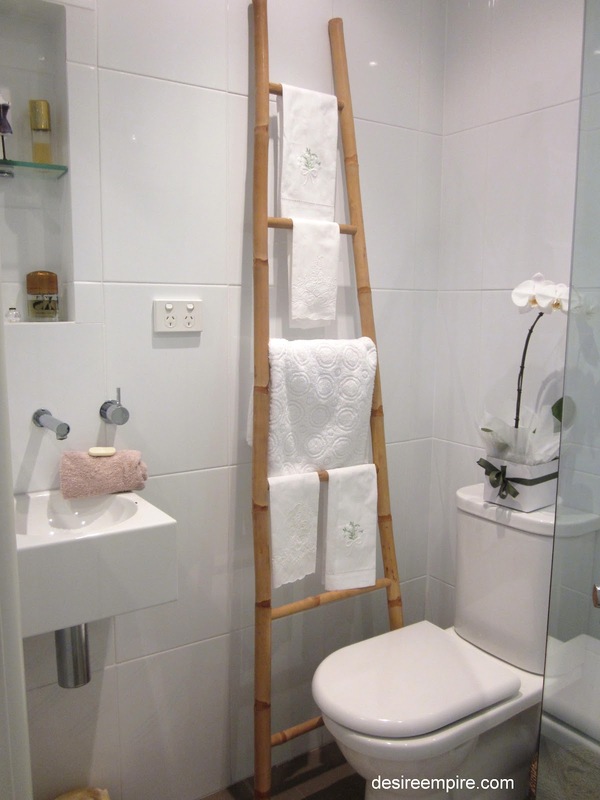 Love the ladder repurposed with the towels! Gorgeous bathroom - I would kill for an ensuite & it would be exactly like yours! Carolyn your tips were spot on - thank-you so much - we had a ball. My surfie husband is one of those guys who loves his own break & his own beach so I nearly fell over when he said Sydney was way better & he would move in a flash if it wasn't for kids, family, friends, work etc. With only a day in Palm Beach we made a good dent on the list but needed a few more days to get through the rest - eg Dunes which looked like a great place but how much can you eat in one day ...so we'll be back. I have written 2 posts one today & tomorrow with thanks to you for your hot tips! What a beautiful part of the world you live in. This is beautiful. I love white on white, and your bamboo latter. Very pretty bathroom! Please come by my linky party hapening now to link it up - I would love to see you there! A pretty and serene little cupboard you have there! Love the story of Mr. Beach house's friend ... we've all crossed paths with one of those sometime in our lives! Your bath is fabulous with great details! And your stories are always terrific! Thank you for sharing at Potpourri Friday! So refreshing and clean! Looks fabulous! I love that basin! What a brilliant size! 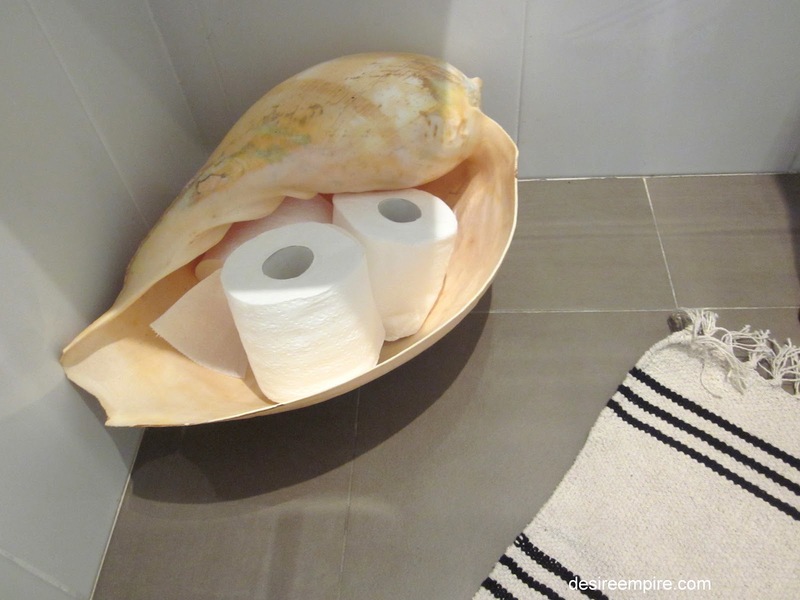 I also adore that shell that is housing your loo paper-very beachy and very stylish indeed! 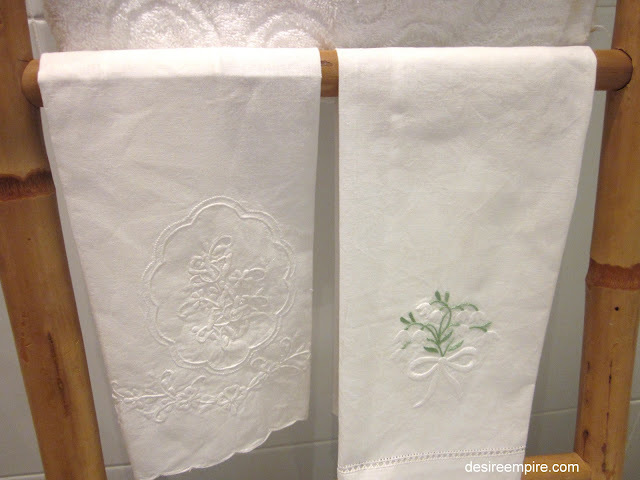 Nice blog and what a lovey bathroom. I´m you newest follower. Beautiful! So serene! Love the towel rack especially!